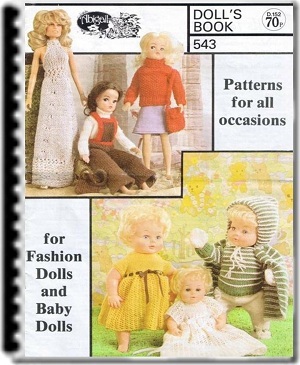 "Plus a cute crochet shawl"
These free knitted doll clothes patterns are just the perfect last minute gift. This one is for a cute knit skirt and top with an very nice crochet shawl. 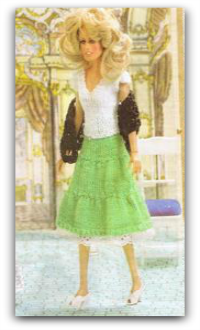 This pattern is for Fashion style dolls and it has 3 sizes 27 (29-31) cms or 10 3/4 (11 1/4 - 12 1/4) inches. 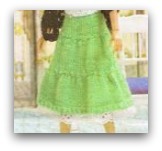 Skirt: 15 (20-25) g. Pair of needles size 3mm (11). 32 cms [12 1/2 ins] broderie anglaise, 1 press stud, shirring elastic. 10 (10-15) g. Pair needles size 3mm (11). 4 press studs. Shawl: 15 g. 5mm crochet hook. Skirt Cast on 91 sts. 1st row : K1, *pi, kl; rep from * to end. Work in st st, starting knit, until skirt measures 3(3-4) cms [1/4(11/4-11/2) ins] ending with a purl row. Next row (decrease): K1, *k2tog, kl; rep from * to end. 61 sts remain. Next row: P1, *kl, pl; rep from * to end. Work in st st, starting knit, until skirt measures 6(6-8) cms [21/2(21/2-3) ins] ending with a purl row. Next row (decrease): K1, *k2tog, kl; rep from * to end. 41 sts remain. Next row: P1, *kl, pl; rep from * to end. Work in st st, starting knit, until skirt measures 9(10-12) cms [33/4(4-41/2) ins] ending with a purl row. Next row (decrease): K1, *[k2tog] twice, kl; rep from * to end. 25 sts remain. 1st row: K1, *p1, kl; rep from * to end. 2nd row: P1, *kl, pl; rep from * to end. Rep the last 2 rows once more. Cast off in rib. Join back seam leaving 2 cms [3/4 inch] open at top. Thread shirring elastic through waist-band if necessary. Sew press-stud in place at top of opening. Sew broderie anglaise in place at lower edge as illustrated. T-shirt back Cast on 16 sts. 1st row: *K1, pl; rep from * to end. Next row: Cast on 2 sts, k these sts, k to end. Next row : Cast on 2 sts, k these sts, p to last 2 sts, k2. Keeping the 2 sts at each end in garter st (every row knit), work 9 rows straight, thus ending with a knit row. Work 2 rows in garter st. Cast off. Next row: Cast on 2 sts, k13 sts, turn and complete this side first. Next row: K1, k2tog, p to last 2 sts, k2. Rep the last 2 rows 4 times more. 8 sts re-main. Work 2 rows in garter st. Cast off. With right side facing rejoin yarn to neck edge of remaining sts and knit to end. Next row: Cast on 2 sts, k these sts, then p to last 3 sts, k2tog tbl, kl. Next row: K2, p to last 3 sts, k2tog tbl, kl. Rep the last 2 rows until 8 sts remain ending with the knit row. Work 2 rows in garter st. Cast off. Join side seams. Sew 2 press studs to each shoulder lapping front over back. Make 5 ch, work 1 tr into first of these ch, turn. Next row: 5 ch, 1 tr into st at base of these-ch (count as 1 V-st), work [1 tr, 2 ch, 1 tr] (called 1 V-st) into 3rd of 5 ch at beg of previous row. Next row: 5 ch, 1 tr into st at base of these ch, miss 2 ch space, work 1 V-st into next tr, 1 V-st into 3rd of 5 ch at beg of previous row. Next row: 5 ch, 1 tr into st at base of these ch, * miss 2 ch space, work 1 V-st into next tr; rep from * to last V-st, 1 V-st into 3rd of 5 ch at beg of previous row. Rep the last row until shawl measures 10 cms [4 ins] at centre. Fasten off. Rejoin yarn to top left hand corner of shawl and work in dc down left side of shawl working 2 dc into each space, work 3 dc into corner, work up right side working 2 dc into each space, work 3 dc into corner, and work along top edge working 2 dc into each space and 1 dc into top of each pair of trs, work 3 dc into corner, sl st to join, break yarn and fasten off. Click on image to see other patterns included in this ebook.